The African yam bean (Sphenostylis stenocarpa Hochst ex A. Rich) is a leguminous crop found in the Volta Region of Ghana. Three expeditions were undertaken in the region between September 1998 and March 1999 to investigate the extent of cultivation and use of the bean as the basis for research into its development and promotion as a major crop. Its cultivation is currently localized around Nkwanta and Ho West Districts. It is grown as a minor crop in mixed association with yam and cassava. It is used extensively in various dietary preparations and has potential for supplementing the protein requirements of many families throughout the year. Its current low status as a minor crop means that this potential is largely unexploited. Research efforts are required to improve its agronomic characteristics and promote its cultivation and use as a major crop. Grain legumes constitute the main source of protein in the diets of the average Ghanaian home. The most important ones are cowpea (Vigna unguiculata), groundnut (Arachis hypogaea) and lima bean (Phaseolus lunatus). However, there are other pulses that could help meet dietary needs but are cultivated only in localized areas and used less. These under-exploited legumes include African yam bean (Sphenostylissaenocarpa), bambara groundnut (Vigna subterranea) and pigeon pea (Cajanus cajan). The African yam bean is grown in West Africa, particularly in Cameroon, Cote d'Ivoire, Ghana, Nigeria and Togo (Porter 1992). In Ghana it is found in localized areas in the Volta Region, where it is grown by peasant farmers as a security crop. It is in danger of extinction because of the high premium placed on the major legumes listed above and others such as soya bean. An additional problem is that this bean receives no research attention locally. The African yam bean is grown for both its edible seeds and its tubers. It is a vigorous vine, which twines and climbs to heights of about 3 m and requires staking. It flowers profusely in 100 to 150 days, producing brightly-coloured flowers, which may be pink, purple or greenish white. The slightly woody pods contain 20 to 30 seeds, are up to 30 cm long and mature within 170 days. The plant produces underground tubers that are used as food in some parts of Africa and that serve as organs of perennation in the wild (Duke et al. 1977; Anon 1979; Porter 1992). 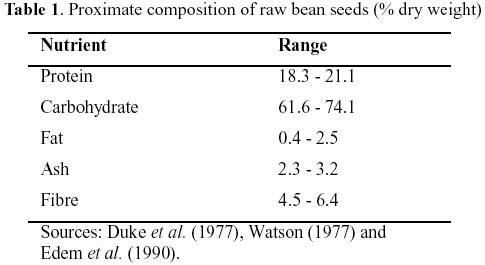 The proximate composition of raw beans is shown in Table 1. The study involved visits to farming villages in the Volta Region, Ghana. Three expeditions were undertaken between September1998 and March 1999 to investigate the extent of cultivation and use of the African Yam bean. Discussions were held with farmers, individually or in groups. Visits were made to farmers' fields when these were accessible. At least two farms were visited in each village visited. In Ghana, the African yam bean is cultivated in the Volta Region, which shares its eastern border with the Republic of Togo. The study area stretches between 6°N and about 9°N and between 0° and 1°E (Fig. 1). Altitude ranges from 0 to 855 m above sea level. Annual rainfall ranges from less than 1000 mm in the south to between 1500 and 2000 mm in the middle and northern belts. 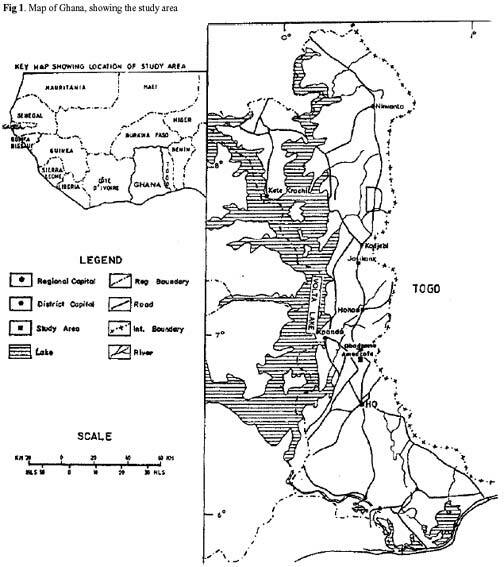 Vegetation type ranges from strand and mangrove swamp in the extreme south to Guinea Savannah woodland and moist semi-deciduous forest along the length of the study area. Soil types also vary. Typically, the south has infertile, clayey soils, which are often inundated with floodwaters. The inland soils, however, are mainly poor in organic matter and nutrients but porous and well drained and support dense vegetation in some districts. The main food crops cultivated in the area include yams (Dioscores spp.) cassava (Manihot esculenta), cocoyam (Xanthosoma sagitiffolium), bananas and plantains (Musa spp. ), maize (Zea mays), sorghum (Sorghum bicolor), millet (Pennisetum typhoides), African rice (Oryza glabberrima) and various vegetables. 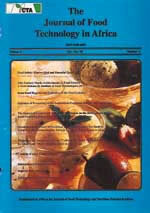 The African yam bean is said to have been introduced into Ghana from Togo in 1958 (Adansi 1975). However, discussions with farmers during this study indicate that the crop was grown in the study area well before this date. Its use in the preparation of special meals during festivals and celebration of puberty rites for girls may date back centuries. However, no wild relatives of the crop were found during the study, nor is there any solid evidence, historical or linguistic, to suggest that the African yam bean originated here. multicoloured ones. Whereas farmers commonly grew cowpea, soya bean and groundnut in pure stands, African yam bean was always found in mixed stands, in association with other crops. No fertilizers or pesticides were applied to any of these crops. In the Nkwanta District, African yam bean was intercropped with yam and cassava and was cultivated mainly by women and children, who constitute the main labour force on the farms. Traditionally, the farmlands are cleared of their vegetative cover and the soil is formed into mounds. Yam is planted first, on top of the mound, followed by two cuttings of cassava stem on the lower contours of the mound, one on either side. African yam bean is planted a month or two later, after the major crops have established. Usually, 2-3 seeds are planted per hill, on or close to the mound. The bean seedlings climb the cassava stems for support with some of them eventually reaching the live stakes used by the yams. No special care is provided for the bean. However, it benefits from weed control, which is done at least twice before the major crops are harvested in September. Women and children harvest the beans, while men harvest the major crops. Local farmers have no basis for estimating seed yield as harvesting is done solely on family demand. Usually the last pods are harvested and threshed between December and January. These seeds are stored in earthenware to provide part of the family's food during the lean season. Some farmers are compelled to sell their seed in the local markets to meet family contingencies. The price is comparable to that obtained for groundnut or cowpea. The cultivation and use of the African yam bean in the middle belt of the study area have declined over the years. Even so, it is still grown in some localities, particularly around Gbadzeme, Biakpa, Logba and Taviefe, where it is called 'Kulege' or 'Kutreku'. There is no gender bias in the cultivation of the crop in this area, where it is also intercropped with yams, cassava and vegetables. The crop is planted in May, after yam and cassava. Two or three bean seeds are planted adjacent to each hill. No special pattern is followed but care is taken to site hills close to juvenile trees saved during land clearing to serve as live stakes. Weeds are controlled by hand weeding, to the benefit of both major and minor crops. Dry seeds are harvested piecemeal, to meet family demands, except where farmers intended to sell seeds. This is made possible by the fact that dry pods do not shatter easily. The last harvest may be done in December. Unthreshed pods are often tied into bundles and hung or stashed above the fireplace in the kitchen for storage. Smoke from the firewood used for cooking repels storage pests, thereby facilitating long-term storage. Throughout the study area, the African yam bean is grown primarily for its dry seeds, which are a nutritious pulse. In the Nkwanta District, the Konkombas mill the dry seeds into flour, which is processed into a paste with water and some condiments. This is then wrapped into plantain leaves and boiled and eaten as 'turbani'. The flour may also be mixed with cassava flour and cooked into a paste eaten with soups or sauces. The Chalas, another ethnic group in the Nkwanta District, boil the dry seeds for about three hours, replacing the water intermittently. The cooked beans are made into a sauce and eaten with 'gari', a roasted cassava product. Some of the farmers interviewed reported that the water drained after boiling the beans may be drunk by lactating mothers to increase their milk production. the seeds and eat them with maize. The mature green beans are also boiled in the pods, shelled and eaten. In Taviefe and neighbouring villages it was noted that goats and sheep feed on the dry pods. The crop also occupies a niche in the socio-cultural lives of the traditional people in this area. It is used in the preparation of special meals during the celebration of puberty rites for adolescent girls. Although there are extensive references to the use of the tuberous roots of African yam bean as a source of carbohydrates in West Africa (Okigbo 1973; Anon 1979; Ezueh 1984; Ene-Obong 1992; Porter 1992), the roots were not used in this way in the study area. Farmers in the Nkwanta District, noted for yam production in Ghana, attach no importance to the bean tubers as their yield compares poorly to that of yam. In the Ho-West District, also noted for production of many local staples such as yam, cassava, cocoyam and plantain, farmers were not even aware of the tuber-producing ability of the crop. Other uses to which the crop is put in the study area are implicit, as these are not obvious to the farmers. It features extensively as an intercrop in the traditional farming system throughout the study area. Unknown to the traditional farmers, it may be serving as a rich source of leaf litter for improvement of soil characteristics. The crop also nodulates profusely and probably has high nitrogen-fixing ability, thereby helping to replenish soil nitrogen. The African yam bean is cultivated in the middle and northern sectors of the study area. It is under-exploited and grown mainly as a minor crop in mixed cropping systems. Once planted, it receives little special attention from the farmer but may benefit from the general agronomic practices applied on the farm. In some localities its cultivation is left in the hands of women and children. Although cultivation of the crop in the region appears to have diminished over the years, owing to the popularity of other legumes such as cowpea, groundnuts and soya beans, several landraces can still be found in the hands of farmers. This may be because the African yam bean suffers less pest damage than the other legumes, both in cultivation and in storage. Throughout the study area, the bean is used mainly as a pulse crop. The dry seeds serve as a source of protein in various food preparations. The dry seeds are used in the preparation of special meals during the celebration of puberty rites for girls in the Avatime traditional, giving the crop a special role in the socio-cultural lives of the people. Its use as animal feed in some localities appears to be of minor importance. Though the African yam bean currently serves only as a security crop, it has the potential to meet year-round protein requirements if grown on a large scale. Currently, only limited quantities are offered for sale in local markets, even though the price per unit of measure is comparable to that of cowpea or groundnut. Large-scale production should, therefore, lead to increases in family income. However, the requirement for trellises or stakes to support plants appears to be a major obstacle to increased cultivation. Modification of the plant's architecture, through conventional breeding or mutation techniques, to obtain semi-erect or erect types, combined with a shorter growth cycle, would make the crop more acceptable for commercial-scale cultivation. Improvement in seed-coat characteristics to reduce cooking time would increase the crop's use in foods. Mutation induction could generate variability in these characteristics from which plants with desired traits could be selected for use in developing commercially acceptable varieties. many farmers we came into contact with for their invaluable support, especially their willingness to share indigenous knowledge with us. Adansi, M. A. 1975. Master register of economic plants (excluding Cocoa) in Ghana. Bulletin No.4. Crops Research Institute, CSIS, Ghana. 97 pp. Anon. 1979. Tropical Legumes: Resources for the future. NAS, Washington, DC, USA. 332 pp. Anon. 1995. Atlas for Ghana. Macmillan, London, UK. 65 pp. Anon. 1996. ICUC 1996 Annual Report. International Centre for Underutilized Crops, Southampton, UK. 16 pp. Duke, J. A., B.B. Okigbo and C. F. Reed. 1997. Sphenostylis stenocarpa (Hochst ex A. Rich) Harms. Trop. Grain Leg. Bull. 10:4-6. Edem, D. O., C. I. Amugo and O.U. Eka. 1990. Chemical composition of yam beans (Spkenostylis stenocarpa). Trop. Sci. 30:59-63. Ene-Odong, E. E. and F. I. Okoye. 1992. Inter-relationships between yield and yield components in the African yam bean, Sphenostylis stenocarpa (Hochst ex. A. Rich.) Harms. Beitr. Trop. Landwirt. 30(3):283-290. Ezueh, M.I. 1984. The African yam bean as a crop in Nigeria. World Crops 36(6): 199-200. Porter, D. 1992. Economic botany of Sphenostylis (Leguminosae). Econ. Bot. 46(3): 262-275. Watson, J. D. 1977. Chemical composition of some less commonly used legumes in Ghana. Food Chem. 2(4): 267-271.